The Greeks have a word for that feeling that expresses joy, fun, passion and loving life: kefi. Our Greece land and island tour lets you fully embrace the spirit of this region, which gave birth to Western civilization, the Olympics and the healthful Mediterranean diet! You’ll experience all of the Greek classics: seeing the Acropolis and Parthenon, sailing the sparkling-blue Aegean Sea and stopping at mythical islands like Mykonos, Crete and Santorini. Along the way, you’ll soak up sun, breezes and timeless vistas. Let’s raise a glass of ouzo to finding your kefi on this odyssey through spectacular Greece and the Greek Islands. We believe world travel is for everyone! That’s why nearly all of our tours are designed to accommodate any fitness level. If you are wondering if a tour’s activity level is suited for you, please contact a member of our team at 1.800.337.7773. Discoverer Comfortable pace. Involves minimal physical activity, such as climbing some stairs, walking for up to two hours at a time on primarily level ground and periods of standing. Explorer A step up. Calls for moderate physical activity, including climbing stairs, walking up to two miles (possibly on uneven surfaces and/or hills) and standing for an hour or longer. Adventurer Moderately active. Requires walking longer distances and standing for longer periods of time. You may encounter hills and uneven surfaces on several days, as well as longer days in general. Of our three tours ranked in this category, two include Machu Picchu. Click the Day by Day itinerary above (or swipe on mobile devices) to see the experiences that await on each day of your tour. Depart for an overnight flight to Greece. Your tour includes airfare from the U.S.
Awaken to Crete, an island rich with history and culture. We’ll come ashore in the bustling capital Heraklion, where you can stroll the charming Lion’s Square, sample a bougatsa (local pastry) at a café or join an optional excursion to see the ruins of the Palace of Knossos. Today we pass through the beautiful medieval town of Nafpatkos on our way to Olympia, the birthplace of the Olympic Games. We’ll join a local expert to tour the archaeological site and museum at Olympia, where the games were conceived as a tribute to Hercules, son of Zeus. As an enduring link between the ancient games and today’s Olympics, the Olympic flame is still lit here in Olympia. We’ll view the impressive remains of the Gymnasium and the Temples of Hera and Zeus, as well as see the magnificent Hermes of Praxiteles, the most famous statue in the Olympia Museum…. For more information on this tour, please contact us here or call us during business hours (Mon-Fri, 9:00-5:30 EST) at 800-337-7773. CABIN UPGRADE: Rates are based on inside cabin (without window). Reservations can be made by phone (1-800-337-7773) and will be confirmed upon receipt of $300 per person non-refundable, non-transferable deposit which must be received within 48 hours of reservation. Full payment is due 90 days prior to departure. Baggage fees may apply. Space and prices subject to availability. For complete booking information and terms & conditions click here. Optional Tours Customize your trip with these optional tours. Book optional tours on board the cruise ship, operated by Celestyal Cruises. You may pay with Euros or with your credit card. Please note that you will likely incur a transaction fee from your credit card company if you pay by credit card. Tours are subject to availability and minimum participation. Please note that optional tours are non-refundable. Tour the fortified Orthodox Monastery of St. John, which holds a beautiful chapel with 12th-century frescos. Halfway up the path to the monastery is the sacred grotto (cave), believed to be where St. John received his visions from Christ recorded in the Book of Revelation. Heraklion is the birthplace of the Minoan civilization, and this optional tour takes you to the colossal palace of Knossos. Its maze of 1,500 rooms is linked to King Minos and mythic characters such as the Minotaur and Labyrinth. Driving along the road you will have the unique opportunity to admire the panoramic view of the Aegean Sea and the neighboring islands. A unique sight is the various layers of lava that can be seen on the face of the rock, each layer being another phase of the activity of the volcano. Built on the Caldera rim, Oia Village is an excellent example of Cycladic architecture. Explore the village walking along the cobble-stone streets and the white washed houses with blue shutters where one gets the impression that they are a beautiful travel poster. After Oia the bus will drive you up to Fira, where you will make your own way back to the ship. This boutique hotel is located in the city center near cultural attractions and features a rooftop garden restaurant. smarTours® is delighted to partner with Celestyal Cruises, a Greek-based, award-winning cruise company that prides itself on offering authentic experiences. Operating mid-sized vessels that are ideal for navigating the Aegean Sea and accessing Greek Island ports, Celestyal offers onboard dining, bars, entertainment and activities, beauty salon, swimming pool, fitness center and more. All-inclusive meals and drinks, cozy cabins and warm Greek hospitality will enhance your cruising experience. Located at the foot of Mount Parnassus, this 180-room hotel features panoramic views to the sea from room balconies and public areas. A small hotel with pool, spa and beautiful terraces, ideally located for Olympia sightseeing. Elegant five-star property in the center of Athens, just a two-minute walk to the Acropolis Museum. Rooftop garden restaurant. Flights from the U.S. and back are on the following schedules. Please make sure to allow sufficient time for clearing customs and immigration if you are planning a connecting flight. We recommend at least three-and-a-half hours. Please note that flight schedules are subject to change without prior notice. Our selected airlines do not assign seats in advance, and smarTours is not involved in seat assignments. Seat assignments can only be arranged at the airport upon check-in. International flights to/from the U.S. are not included. Land-only travelers are responsible for arranging entry and exit flights, as well as their arrival and departure transfers. smarTours cannot be held responsible for any damage caused by air schedule changes and delays. Unused land services are non-refundable. Main Tour: Land-only services start upon independent check-in at Athens hotel on Day 2 of the itinerary listed on the tour page. Land-only services end after breakfast at Athens hotel on Day 11 of the itinerary listed on the tour page. You must possess a passport valid for at least 6 months after the date of travel. U.S. citizens do not require visas. Non-U.S. citizens should check with the respective consulates for current visa requirements to all their travel destinations. Please remember that it is your responsibility to obtain the necessary travel documents before the trip. Your airline tickets along with final instructions and additional travel tips will be sent to you 7–10 days before the scheduled departure of your tour. Please make sure to advise us in case your address changes. Immunizations are not currently required. However, you may wish to consult your personal physician or local public health authorities as to their suggestions. Expect daytime high temperatures in the 60s in April and November; 70s in May and October and 80s in September. Evenings and early mornings may be cooler. The hotels used on this tour offer several dining choices, with the average cost for dinner (excluding drinks) in a casual restaurant about $20–$25 per person. Your hotel will accept credit cards for your non-included meals. Optional sightseeing tours and evening activities will be offered. Hotels and some stores accept major credit cards. However, for “street shopping” you will need local currency or U.S. Dollars. Your hotels will be able to exchange cash to local currency. It is recommended that you bring along cash in small denominations. Each passenger may bring one piece of checked-in luggage (suitcase) max. 44 pounds, and one carry-on not exceeding 18”x10”x8”. We recommend that you do not overpack and that you take a variety of casual separates with climate and comfort in mind. Check out photos taken by smarTours travelers on this trip of a lifetime! 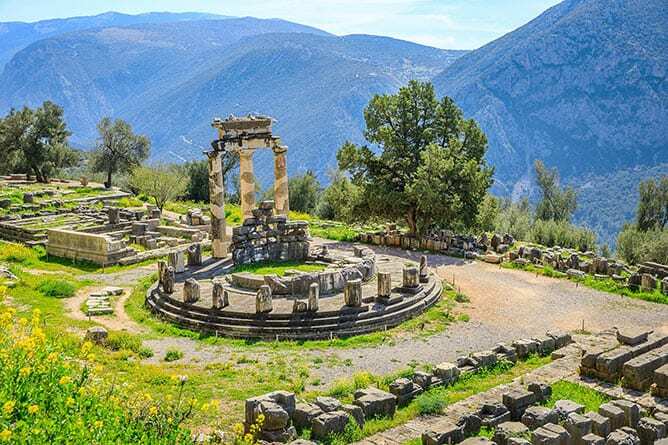 in overall the trip was wonderful, especially, land portion (Delphi and Olympia). Cruise part was ok, but very little time for Island tours. our lead Guides (Granville and Nina) and local guides were very nice and very knowledgeable. Especially both lead Guides were very helpful and made our trip enjoyable. And special thanks to Elias (our driver on the land tour), he was wonderful always so helpful and keeping eye on all our needs. He made out tour so enjoyable. We thought Smart Tour could improve this tour by allocation (or extending the tour time) longer for few days especially time spent on Islands. We thought planning for Island visit could be longer as some of them were quite short like Santorini. Turkey portion of the tour (Ephesus) was breath taking and nice little touch with a side visit to carpet factory. Our Hotel at Athens on first day was at best not what we expected (very small rooms), we thought food on the ship, especially breakfast and lunch, could be better. In overall, it was a good tour and got to see and learn more about Ancient Greece. I thoroughly enjoyed the spectacular Greece tour. The guide Granville Lee-Warner was fabulous. He made the tour extra special being personable, knowledgeable and giving us an extra excursion on the Island of Rhodes. I enjoyed Victoria as well for the land tours. She was very knowledgeable as well. What makes one Tour company superior to another? Surely, the destinations are the same as are the methods of transportation and the accommodations. So what made SmarTours “Spectacular Greece with Island Cruise” so wonderful?Two things come to mind: (1) the quality of the tour guides and (2) people!SmarTours “Spectacular Greece with Island Cruise” destination boasts two guides; one for sea and the other for the land portionOur first guide, Granville Lee-Warner greeted us with a huge smile at Athens airport. And it only got better from then. He was organized, thoughtful, knowledgeable. He regaled us with historical information that infused the tour with added appreciation. He also took us on extra walking tours that gave us added flavour for the locals. He pointed out the better eating and shopping areas. Absolutely entertaining! A man who loves what he does.Victoria was our land guide. She was very personable. An encyclopedia of information. Organized, funny, thoughtful. Energetic.What else makes SmarTours different? The people! Not only the sales staff in the office, but the fellow travellers.This is my second SmarTours destination. I travelled alone (from Montreal, Canada) on this second destination with much trepidation. My first was South Africa Highlights (which was unbelievable! I highly recommend it! )Travel is much about destination but MEMORIES ARE MADE BY SHARING WITH OTHERS. What an extraordinary group of travellers. What fantastic dinners we shared: laughs, wine, entrees, experiences! Many have become my friends. Many are on their second and third destinations; some are beyond ten! No doubt, my new friends and I will make plans for another SmarTours destination.I have booked my third destination with SmarTours and look forward to many more. I entrust my “travel bucket list” with SmarTours entirely. This tour of Greece was AMAZING! We returned 2 weeks ago and my heart still skips a beat when I look at our pictures. Granville was personable, great at making sure we got where we needed to go, and shared stories that made the places we visited come alive. You could tell the country and people of Greece touch his heart.The local guides that met us at various points were delightful. Two in particular were Fuelia at Ephesus and Susie on the island of Patmos. The staff on the cruise ship were kind, efficient, helpful and tireless! The tour of the islands offered a postcard picture opportunity at every turn and the people of the islands were warm and welcoming.For the second half of the tour we were blessed with the WEALTH of knowledge that was Kassandra Porioti. Her vast and varied comprehension of the historical sights we visited was astounding. She knew backstories and dates like the back of her hand and as a bonus she took us to wonderfully scenic and quaint coffee stops along the way and recommended the BEST restaurants in each town.We LOVED our time in Greece, and wouldn't hesitate to go with smarTours again. In fact, even though it was our first tour, several of the people in our group had been on MANY trips with smarTours all over the world, which was a huge compliment to the standards of the company.Thank you, thank you. We are forever grateful for this opportunity. I just returned from your fabulous Greece tour and wanted to commend Granville Lee Warner for the best tour guide experience I have ever encountered. He was so personable and was there for all of our needs. He brought such a delightful presence to every part of the tour and helped make us all feel like friends as well as fellow travelers. I feel so blessed to have met him and will definitely keep in touch for future travel. You are lucky to have him as part of your company! I just returned from the Spectacular Greece Tour April 28-May 9, 2018. This was my first tour experience and first time Greece. What an amazing trip! It was jam packed with excursions to see things that I'd only read about in history books. The cruise to the islands was just amazing. I only wish I'd had more time to spend on each of the islands. The hotels that were chosen by SmarTours were top notch! As were the buffets at the hotels.A special shout out and thank you to our amazing tour guide Granville Lee-Warner! As soon as I met him at the airport, I was greeted with a smile, a hug, and a warm welcome. I immediately relaxed and knew that I would be in for a great time. He imparted his vast knowledge of Greece to us. He suggested great places to eat and shop. He warned us about potential dangers from street crimes such as pickpockets. He took great care of our group and made sure we were informed as to departure and meetup instructions from and to our venues. He made himself available to us 24/7 for any concerns.I hope to return to Greece again for another tour! One of the best tours I ever went to. Amazing locations and lot of history to discover. Especially enjoyed the Tour Guides like Granville. Made it very memorable. I had the pleasure to journey to Greece with smarTours in May. I just wanted to complement you on the quality of the tour and especially the tour guides. Three in particular: Granville Lee-Warner, Matina Chountala, and Thalia Zervaki were memorable for their charm, knowledge, and professionalism at every step of the tour. They created for a me a lasting experience that I will not forget. If you want to see Greece and all of the most important sights that launched civilization this is the tour for you. The cruise was wonderful, food good and staff very friendly and efficient. The land portion takes you to all of the classic sights that represent the birthplace of modern thought and culture in the western civilization. The hotels were all wonderful and food excellent. Now for the guides - the best tour guide I have ever had took our group on the cruise portion. His name is Granville Lee-Warner and he is extremely knowledgeable of Greek history but more than that he represents the soul of the Greek people. I cannot express how well he leads you into the heart of Greece and how these people defined western civilization. The land portion of the trip was guided by Matina and she was an encyclopedia of Greek history and so fluid and helpful. Would highly recommend to anyone looking for a great all in one trip of Greece. This was our 3rd trip with smarTours, and we have enjoyed every one of them. We experienced a wonderful variety of sites. There was so much to see and do on this trip. Our guides were excellent, and our tour directors, Granville and Elena, both deserve special kudos for their breadth of knowledge and for making this trip so memorable. This was our 1st smarTours trip. Based on this excellent experience we plan to do more. There was so much to see and do! I am so glad we finally made it to Greece and the Aegean Sea. Granville Lee Warner and Elana were outstanding guides. Both Granville and Elana were enthusiastic, knowledgeable and dedicated to making our trip as enjoyable as possible. We signed up for all of the side trips and thus our days were full. Yet the pace was always just about right and our travel group really enjoyed each other’s company. Credit Granville and Elana for our learning experiences, group cohesion and many fun times. This was our 2nd SmarTour trip and lived up to its name. The itinerary was very ambitious and not for the faint of heart. Nevertheless , despite the the amount walking/climbing , you never felt rushed and there were plenty of rest stops along the way. The amount of information and education we received on both the cruise and land tours was phenomenal due to the excellent guides we had on board and land. Granville Lee Warner was nothing less than phenomenal. His enthusiasm, compassion and breadth of knowledge were exceptional and his personality infectious. His anecdotal stories along the way were entrancing. Elena, was was a gem. Her knowledge base of archeology and Greek mythology was extensive and presented in a clear story book method that was captivating. It was Granville and Elena that made this trip as enjoyable and unforgettable as one could hope for and not to be forgotten. Our Greece trip was our 5th with SmarTours and was fabulous throughout ! The tour directors ,Granville and Elena, were beyond superb ! Their knowledge of and passion for Greece was the glue that made our group so tight knit. We are in our 70's and the pace of this tour gave us all we wanted,physically speaking. The tour also gives you many tremendous sights and history that makes travel so worthwhile. Despite the turmoil in Syria, we always felt very safe in Greece and would urge you to make the trip. (Our trip dates were 4/30-5/10/16). Great job, SmarTours !! I really enjoyed my tour of Greece.We were impressed with our leader and how he finagled our own little lounge to give us tour info and the speedy way he got us off the boat to have more time. It was disappointing to get to an island in tne dark. I really enjoyed Elana , She has a great personality and would love to know when she has her baby. The Mt climbing was a little rough on my knees,but I never felt rushed. I has just studied about John and Ephesus this fall so it was so meaningful to me. I was really awed. ONe highlight for me was seeing the original huge vase in the Nat. museum of one my husband had brought for me many years ago. One suggestion is to tell people the temp in the Mt is colder than Athens . Also warn them about losing day light saving. Where do I begin? To start we had a 4 day boat cruise to Mikonos, Rhodes, Crete, Patmos, Santorini, Ephesus Turkey with our fantastic tour guide Mr. Granville Lee Warner. Granville was the super star guide. Passonate, personable and exetremly knowledgeable about Greece and its special places to visit and enjoy. The next four days was a land tour on tour buses. Out tour guide Matina and bus driver Mario were good and we survived the mountains of Delphi, Nafpaktos, Olympia and Mycenae and finally Athens. During the land tour Granville rejoined our tour and we finished off with a Metro ride in Athens with Granville. What a fabulous tour! I must thank Granville for all his hard work getting us back and forth without a hitch and fabulous stories and visits to those special places. Coach.